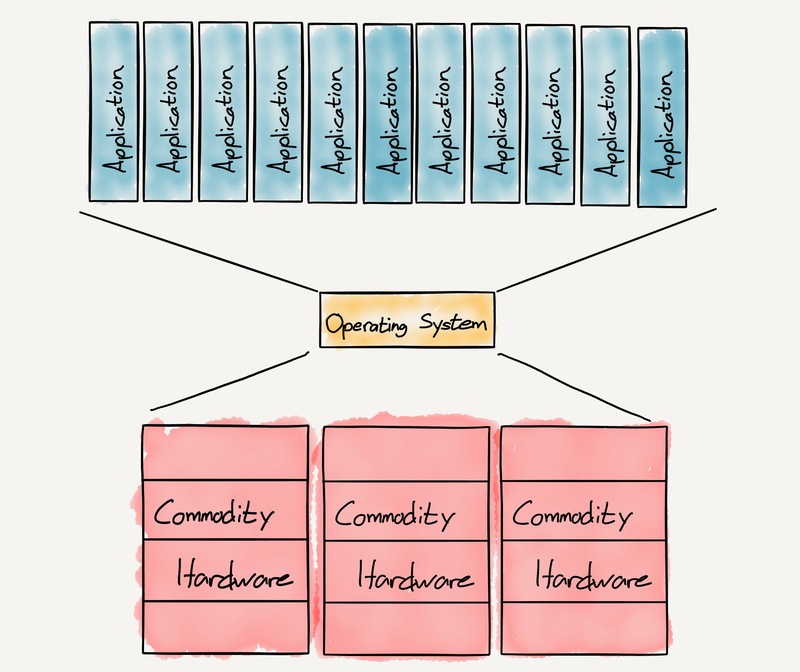 First, by abstracting away the hardware an operating system reduces the plane of competition for hardware providers to pure performance (as opposed to, say, lock-in). In the short term this increases competition amongst hardware providers, which benefits the operating system, and in the long run, when performance becomes “good enough”, hardware is effectively commoditized allowing the operating system to capture the majority of profits in the value chain. Second, by providing a consistent set of interfaces for software, operating systems create network effects: the more users there are of an operating system the more software applications that are developed for that operating system; this in turn drives more users which increases the addressable market for developers further still. In the long run this results in lock-in for both developers and users. Third, operating systems by definition have a direct interface with end users, and owning the user relationship is massively valuable for the leverage it creates over entire ecosystems. Much of the history of technology, particularly in the consumer space, is about owning the operating system. Windows fostered and benefited from competition for nearly every piece of hardware in PCs, resulting in massive increases in performance and massive decreases in price. Meanwhile, thanks to IBM, Windows (well, DOS to be precise, Windows’ command line interface-driven predecessor) was the default operating system for enterprise, which meant there was nearly immediately a huge and rapidly growing market for developers, which increased the desirability of Windows in the sort of virtuous cycle I described above. Windows then leveraged its ownership of users to build out two other massive businesses: first its Office franchise, and then its Windows Server line of products. On mobile Microsoft tried to repeat the trick, only to have its market stolen by Google’s Android, which was not only better than Windows Mobile but also free; unfortunately for Google, Android was so successful in its goal of ensuring Microsoft could never profit from the operating system chokepoint on mobile that Google itself was handicapped when it came to making money. Android provides valuable data and indirectly contributes to Google’s search-based profit-engine, but it is not nearly the business that Windows was. Apple, meanwhile, has always had a different business model: selling hardware. That hardware, though, is differentiated by its own operating system; thanks to the sheer size of the smartphone market this has led to far greater revenue and profits than even Microsoft in its heyday, but the model is ever so slightly more fragile than Windows’ was: Apple has to not only bear the risk inherent to building hardware, but also by definition can only ever own a minority of the market. First, no company could ever build enough phones for the world, and secondly, to serve every customer would ruin the profit margins that make the business model so successful. That, by extension, has meant a duopoly with Android, resulting in most developers serving both markets; Apple still has a moat, but it’s not nearly as deep as Microsoft’s used to be. This brief history of consumer operating systems is less complete than it seems: Android and iOS have replaced Windows in importance, but in fact Windows lost its lock-in well before Steve Jobs launched the modern smartphone era in 2007. The Internet made the operating system of the computer used to access it irrelevant, and the most dominant company on the Internet was Google. While websites could be accessed directly by typing a URL, in practice most websites in the desktop era were reached via search, akin to how computer hardware was accessed via a common operating system. And, just as hardware vendors had no choice but to commoditize themselves, websites had no choice but to make themselves as Google-friendly as possible. The interplay between developers and users created a virtuous cycle that created Windows lock-in; in the case of Google the interplay was between users and the data they generated. Suppose you took two otherwise identical search engines and give one 51% of searches and the other 49%: the former would steadily become better than the latter simply by virtue of having more data on which to iterate. The reality in the case of Google was much more extreme: the company started out with a technological and engineering advantage over its rivals, which earned it market share, which then gave the company data with which to increase its quality lead even further, earning it even more market share; the end result was a monopoly built on user choice. Over time Google has leveraged its relationship with users to build out its own suite of products — or, in many cases, acquired companies that gave it new opportunities to grow. Google could afford the acquisitions thanks to a new business model for “operating systems”: advertising. Advertising doesn’t make much sense for traditional computer operating systems, which need to be platforms for applications — there is no room for the ads. Google, though, was a platform for attention, not applications, and attention is exactly what advertisers crave. To that end, the business model wasn’t so different after all: operating systems are the chokepoint of the value chain in which they operate, and money always flows to the chokepoints. Facebook’s “suppliers”, in this case publishers, have fully commoditized themselves by not only putting their content on Facebook but even using Facebook’s preferred format; they have no choice. Facebook’s network effect is perhaps the most straightforward of all: it is the people you know (which is one of many reasons why Snapchat is such a threat). Facebook’s ownership of users pays off with its business model as well: not only does Facebook own attention for nearly two billion people, it also has better data about who we are and what we like than any company ever; after all, we told the company ourselves. What is so fascinating about Facebook’s dominant position on mobile is that it was in many respects a lucky accident: Facebook on the desktop had designs on being something much more akin to a computer operating system, abstracting away the underlying operating system and building an application platform on top. And, when mobile rose to prominence, Facebook tried to build their own phone, convinced that was the only way to own users. As I just noted, though, an application platform is fundamentally incompatible with an advertising-based business model; by extension, an advertising-based business is not necessarily in conflict with the operating system on which it runs. In the case of Google, the company made its fortune on top of Windows; the dominance of iOS and Android made Facebook just an app, which was the best possible thing that could have happened to the company. Amazon made the same mistake as Facebook: convinced it needed its own operating system and the direct access to users that entailed, the company made one of the worst phones in history. The product was misguided for all kinds of reasons, most of them predictable: iOS and Android may have been a duopoly, but their shared developer lock-in was arguably no less imposing than Windows’ had been (as Microsoft itself found out). More fundamentally, Amazon sought to sell the phone through hardware and OS differentiation, much like Apple, but the company could not be more different organizationally and culturally from the iPhone maker; you don’t make good products because you really want to, you make good products by fostering the conditions in which great products can be made, and Amazon’s deeply rooted culture of modularity and services was completely ill-suited for building a highly differentiated physical product. One of the things that makes Amazon such an impressive company, though, is that modularity and willingness to make multiple bets: on October 24, 2014 Amazon took a $170 million write-off on the Fire Phone business; two weeks later, the company launched the Amazon Echo. The physical device (the Echo) was simply a conduit for Alexa, Amazon’s new personal assistant. And critically, Alexa was a cloud service, the development of which Amazon is uniquely suited to in terms of culture, organizational structure, and experience. The Echo created its own market: a voice-based personal assistant in the home. Crucially, the home was the one place in the entire world where smartphones were not necessarily the most convenient device, or touch the easiest input method: more often than not your smartphone is charging, and talking to a device doesn’t carry the social baggage it might elsewhere. There was an ecosystem to assemble: more and more “smart” products, from lightbulbs to switches, were coming on the market, but nearly every company trying to be the centerpiece of the connected home was relying on the smartphone. Secondly, “Alexa” and “Echo” are different names because they are different products: Alexa is the voice assistant, and much like AWS and Amazon.com,2 Echo is Alexa’s first customer, but hardly its only one. This year CES announcements are dominated by products that run Alexa, including direct Echo competitors, lamps, set-top boxes, TVs, and more. That leaves the business model, and this is perhaps Amazon’s biggest advantage of all: Google doesn’t really have one for voice, and Apple is for now paying an iPhone and Apple Watch strategy tax; should it build a Siri-device in the future it will likely include a healthy significant profit margin. Amazon, meanwhile, doesn’t need to make a dime on Alexa, at least not directly: the vast majority of purchases are initiated at home; today that may mean creating a shopping list, but in the future it will mean ordering things for delivery, and for Prime customers the future is already here. Alexa just makes it that much easier, furthering Amazon’s goal of being the logistics provider — and tax collector — for basically everyone and everything.